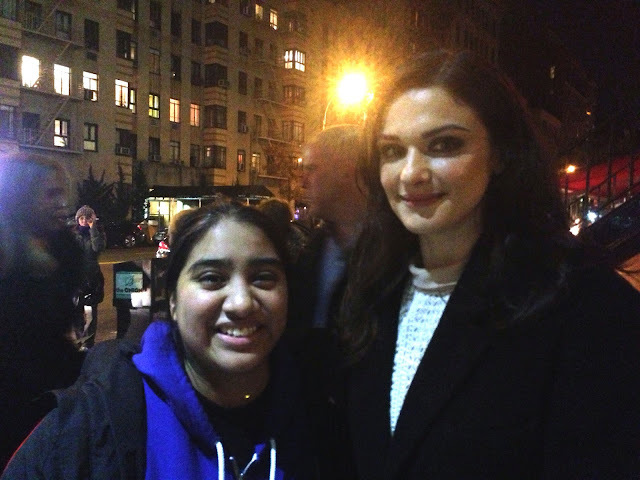 WillingToBeLucky.net: My awesome Rachel Weisz encounter! It finally happened! I finally got a photo with Academy Award winner and gorgeous human being, Rachel Weisz! After trying countless times this year both during The Bourne Legacy promotion and otherwise, I had almost given up hope it would happen this year! So, when my buddy, Dan found out she’d be doing a Q&A for The Deep Blue Sea, I HAD to be there to try. I kept hearing how tricky it was to get her lately but I still held my breath that this would be the night! I was working until 8 that day and would probably make it to the theatre in time for her to arrive. It also happened to be the same night as the Lincoln NYC Premiere so we had hope no one would be there. We were right. A couple of nice collectors I knew from a few other events showed up as well and we all settled in. While we waited for her, Dan and I noticed a familiar looking man arriving at the theatre. It was Tony Gilroy, director of The Bourne Legacy! We called out to him and he was incredibly surprised we knew who he was. We both asked for pictures and he was kind enough to stop and take them, sort of laughing at the fact that we recognized him. Almost immediately after that, Rachel Weisz arrived, looking gorgeous, as always. She ended up getting there pretty late, at least a half hour later than we thought she would be. A girl came out of nowhere and asked for a picture, taking FOREVER. She patiently waited while Mr. Gilroy snapped the photo for them. Her security was rushing her inside because she was running late but she managed to sign for one of us, saying that she would get the rest on the way out! (I had brought my folded Bourne Legacy poster from Empire Magazine and realized I could’ve gotten Mr. Gilroy on it too. D’oh!) I REALLY wanted a picture more than the auto but I figured she would probably do one or the other, if she did any on the way out. Still, there were only four of us there so my hope wasn’t totally lost. She snaps photos with the other two and I manage to slip my poster in and she signs it as she heads to her car. I’m in awe that it happened. Even now. SUCCESS! It's so surreal, even now, I'm glad I have a photo or I'd thought'd been a dream! I did a longer version of this write up for Mike The Fanboy so feel free to head over there, the post should be up soon! I have a few other posts there, too! How was she with you? Did she seem happy to give you a picture? I LOVE her. You're so lucky, Hope I get the chance to meet her someday.